A former firefighter, Louis K. Lowy is the recipient of a State of Florida Individual Artist Fellowship. His first published novel, Die Laughing, is a humorously dark science fiction adventure set in the 1950s. 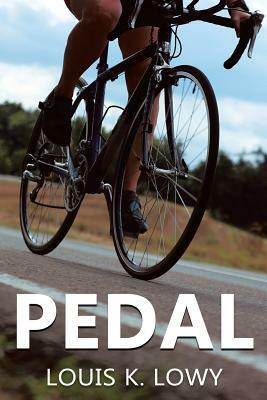 His current novel, Pedal (Panoptic Books; 2016), tells the story of 49 year-old music teacher Joanne Brick, who loses her job and struggles to reclaim her life back through bicycle racing. His sci-fi drama, To Dream: Anatomy of a Humachine, Book 1 is scheduled for release in 2016. His stories have appeared in, among other places, New Plains Review, The MacGuffin Magazine, and the anthology, Everything Is Broken. Reach Lowy at www.louisklowy.com or on Facebook and Twitter. Lowy will be one of the authors reading at the Catalogue Launch at Girls’ Club, Saturday, June 25th at 7pm. For this interview, Girls’ Club Writer in Residence, Jan Becker, talked with Lowy about the evolution of his latest novel, the challenges of writing outside of one’s gender, the influence of female writers on his work, and how a writer who first published a campy, sci-fi novel finds readers when his followup novel is about a realistic middle-aged woman, who finds herself down on her luck. An excerpt from Pedal follows the interview. JB: Louis, thank you for agreeing to discuss your new novel Pedal with me for the Girls’ Club blog series. For most of these interviews, I’m focusing on women writers and how the idea of self-proliferation figures into their work. You’re a little different, in that you’re male. But I wanted to talk to you, because the main character—in fact, most of the main characters—in your new novel are women. It’s not so unusual for a writer to focus on characters who have a different gender, but I’m curious, in your case, how does a retired firefighter end up writing a novel about a middle-aged, out of work, music teacher? LL: It had to do with my desire to tell a good story and at the same time act as a response to my first book, Die Laughing. I felt at the end of that novel that I had told a tale with larger-than-life exteriors. That is, shape-shifting aliens, oil refinery explosions, teleportation devices, flying saucers and a live television broadcast. Even my protagonist was a larger-than-life figure—a Las Vegas comedian who fights to save the world. For my next novel, I wanted to tell a quieter, more intimate story, one without the hoopla, but one with as much at stake. That was the seed behind Pedal. From there, it was determining the plot. That is, what the struggle would be, how the main character would fight back, and why it was important for that character to do so. I ended up working with a single, middle-aged woman—Joanne Brick—whose world revolved around teaching music, because I was going to take her world away, and I thought she would possess the qualities essential to overcoming a dilemma of this magnitude. I also wanted someone who didn’t fit the demographics of a typical protagonist. Lastly, I wanted to challenge myself, to see if I could write credibly about someone like that. I decided to make Joanne a music teacher because I played in bands for many years and I wanted her to have the sensitivity of a musician—which is the opposite of her sister, who is a dominating, no-holds-barred woman. Among other things, Pedal is very much a family drama. Joanne, her sister and their feisty, elderly mother live together. I thought the dynamics between them would potentially be dynamite, which is always good for storytelling. As to how I chose cycling as the catalyst for Joanne’s journey, it dawned on me that cycling is not only physical, but also affords the biker time to contemplate as they’re training. Though I was never a racer, I loved to cycle in my early college years. Cycling allowed me to unclutter my mind and to hash things out. Someone like Joanne would also do the same. The reason why she chose cycling as a coping method was important to me, too. Once I had worked that out, I had the building blocks for a compelling novel. JB: Was there anything surprising about writing a female protagonist? What, if any, personality traits do you share with Joanne? LL: The most surprising thing was I foolishly thought, how hard could it be? Stupid, stupid, man. As a writer, one of my jobs is to flesh out my character’s experiences and personalities, and formulate truthful reactions from them based on their lives, not mine. That most of the characters are female complicated the task. I wanted Joanne, her sister, and their mother to come across as certain types of people. At the same time it was crucial the reader maintained that they were females. One of the most difficult things for me was the family dynamic. It was crucial to the book and I was constantly tweaking it. A wrong word here or there drastically altered the perception I was going for. For instance, sometimes Joanne came across as too forceful, other times not forceful enough. Other times her sister came across as too harsh, and their mother as more grumpy than feisty. Fortunately, I belong to a writer’s group with lots of very talented women in it. Their insights and comments were crucial to not only getting Joanne right, but also her sister and their mother. Regarding similar traits that Joanne and I share, I think we’re introspective, secure and yet insecure, and tenacious. I’m disciplined, but Joanne is more so. She’s probably a better musician, but I’ve probably got a better sense of humor. JB: There’s been, for some time, a divide in publishing numbers between male and female writers. According to the annual VIDA count, men tend to publish more often, and so by extension, I think they’re more likely to be named as influences by other writers, both male and female. I’m curious to know, which female writers you count among your favorites? What about their writing appeals to you? LL: Jane Austen is a favorite and a big influence, particularly Pride and Prejudice. I use her storytelling techniques all the time: introducing a character or object before it plays an important role so as to seem more natural when it does, characters trying to achieve a certain goal but due to their efforts reversing what they had intended, and her use of an object (in Pride and Prejudice, a letter) to turn the plot in a completely different direction. I love Louise Penny’s mystery novel, Bury Your Dead. Her use of flashbacks is amazing, and her characters have such depth. Eudora Welty’s short story, “Why I Live at the P.O.” is a great lesson on the use of humor. Flannery O’Connor’s “A Good Man is Hard to Find” is classic southern gothic. Edith Wharton’s use of plot twist in “Roman Fever” is amazing. There are many other wonderful female writers whose work I’ve read: Margaret Atwood, Katherine Mansfield, Barbara Parker, Joyce Carol Oates, and Shirley Jackson. It’s a deep well. JB: Your first novel, Die Laughing, was a campy takeoff on 1950s sci-fi B-stories, and I imagine you had a specific audience for that book in mind. Did you have a different sort of reader in mind when you were writing Pedal? I’m also curious about the challenges of reaching your audience, and building a readership, because these days, most of the publicity for a book falls on the author. How have your readers responded to the new book? Have you had to market the book differently? Though I knew the audience for the two books was going to be different, I didn’t give too much thought to it while I was writing Pedal. As I said earlier, my concern is trying to always tell a good story. If I start worrying about audience perception it’s going to influence the narrative, which is something I try to avoid. For me, it’s important to tell the story I want to tell, and hope for the best. That’s not to say I’m opposed to changes in my work, but I feel it’s crucial to have my vision on the page, before the page is altered. Regarding marketing, reaching an audience is always a challenge. It requires work and patience. It’s never easy and it doesn’t happen overnight. I’m always grateful whenever someone picks up one of my books. Other than gearing Pedal toward a different audience than Die Laughing, the marketing basics are pretty much the same. The big difference is that I’ve learned more this time around. A large part is due to Assent Publishing, who released Pedal. They developed an online academy for their authors devoted to marketing. Subjects include social media outreach, press releases, book reviews and other promo techniques. On top of that, I’m always discovering new outlets and making new connections. By the time my third novel is released (either late this year or early 2017), I’ll know even more. Concerning reader reaction to Pedal. So far, so good. What pleases me the most is that readers grasp that Joanne’s racing isn’t the cure for her problems, but the instrument she uses to face them. And, of course, I’m pleased when they tell me Joanne feels like a real woman. Both of these were important to me in the writing of Pedal. Joanne pinched back tears and tried to force her mind to the present, but as she had done so many times, she dwelled on the meeting with Principal Haley. She recalled how the hall bell had clanged as she entered his office and how she had stared out his window at the long row of bicycles shimmering in the afternoon sun. She remembered watching the children spring from their classrooms to the metal racks, unlock their bikes and race home for the summer. She relived the moment when she glanced up at the large GE wall clock marking time as Principal Haley swept into his office, motioned for her to sit in the chair facing his desk and said, “Ms. Brick,” while he took his place. “Yes, sir, I’m aware of that. I was thinking if need be, we can stretch the music books out another year.” Joanne folded her hands on her floral skirt and waited. Joanne remembered twirling a strand of hair from the side of her head as she studied Principal Haley’s brown eyes. Her stomach tightened. Involuntarily her hand went to her chest. She nodded, but never in a million moons did she think anyone with her seniority would be fired. “The board has already reviewed the budget and approved the necessary cuts. I’m terribly sorry.” Still the principal’s eyes had remained on hers. “You have a month’s worth of sick leave coming to you.” Joanne thought he should have at least had the dignity to lower his gaze in something resembling shame. Joanne studied the hand, a hand nearly fifteen years her junior, a hand that never taught a child to wave a baton or to press the air holes of an ocarina, a hand that had never tucked a xylophone mallet into an eager child’s fist. It was a fleshy, puffy, bureaucrat’s hand. Joanne could tell by his condescending tone that he knew she didn’t have a prayer of it standing up in court. Contracted teachers had been let go before in Forest Creek. She remembered Mr. Steck, the gay science teacher, and Miss Ginsberg, who tried to start a teacher’s union. Both dismissed and never heard from again. Then Principal Haley’s phone had rung. He had picked up the receiver, hesitated, and said to Joanne, “I’m sorry, I’ve got to take this,” before turning aside. Joanne had nodded. Numb, she barely remembered walking out of the brick school building to the bike rack and rubbing her hand along the metal frame. She had thought of her life and for the first time it had felt as hollow as the rack’s tubular steel pipes.